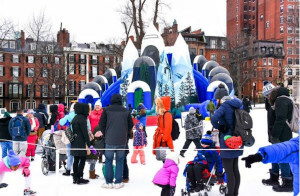 Mayor Martin J. Walsh and the Boston Parks and Recreation Department will be bringing the annual Children’s Winter Festival to Boston Common in partnership with the Highland Street Foundation during school vacation week on Wednesday, February 20, from 10 a.m. to 2 p.m.
Come join us for free games and activities on the Common during public school vacation week. Among the attractions will the 45-foot-long Toboggan Tunnel mountainous adventure with twin roller lanes, the 30-foot-high inflatable Everest Climb N Slide, a Ski Lift photo op, sledding, and much more. In addition, the Highland Street Foundation is sponsoring a week-long Winter Camp at the Boston Common Frog Pond with free skating and rentals for all ages from Monday, February 18, through Friday, February 22. Additional support is being provided by XFINITY, Capital One, the Floating Hospital for Children at Tufts Medical Center, L.L. Bean, and Cricket Wireless. For more information, please call the Boston Parks and Recreation Department at (617) 635-4505, visit www.cityofboston.gov/parks.